oh, silly me, i nearly forgot; i’ve rambled on about ether’s pure brilliance here, here, and performed an award-winning* dramatic performance about it here. but it’s time for me to rave about ether once again, because from today you** can download the new, improved, all singing, all dancing*** ether iphone app v1.4. since i last wrote about the fantastic work ether are doing to push the short story into the smartphone age, they’ve massively picked up momentum. almost every day now, ether books’ facebook page and twitter feed raves about new releases; more talented writers are joining ether every day, many of whom are well-established award-winners who often offer their stories for free. because they’re nice like that. not because they’re rubbish at writing and can barely give it away. and, as i’ve said before, i’m proud to have had two stories published by ether books so far (‘i think the sun is shining’ and ‘bcc:’, both frankly brilliant and yours, here), largely because i’m amongst such fine company. anyway, ether themselves talk far more convincingly – and professionally – about the benefits of v1.4 here and here. this new world of mobile reading isn’t going to fade away – the rise of the mighty kindle has proved that – and ether will have more to offer as time goes on. this week they announced that, as well as short stories, essays and serials, you can also download weekly columns by well-established writers and journalists via the ether app. 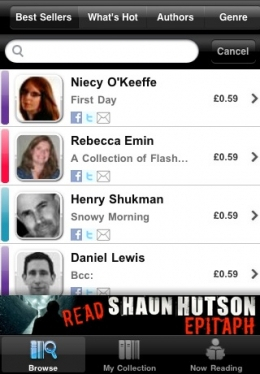 plus ether will, sooner rather than later, be available on android and blackberry too. the ether universe is expanding. so come on, get involved. before everyone starts laughing at you more than they already do. sorry. shouldn’t have mentioned that. it’s nothing, honest. nothing. i just do these things out of pure love. d) thinks “£7.99 for a book? bugger that, i’ll spend 59p on just one of the stories instead. that’s a reasonable price”. there must be one of you out there…so please buy it when it comes out. fret not – i’ll let you know. so. what now? well, first, i’d recommend grabbing your iphone and downloading the ether app v1.4. even if you’ve been kind enough to listen to me in the past and get involved, you’ll need to update the application to get the best out of what ether has to offer. * ‘best iphone app-pimping whilst eating confectionary performance’ category, the idiot awards, 2011. ** when i say ‘you’, i mean ‘you, if you’ve got an iphone’. we’ve already discussed what you need to do if you don’t own one. seriously, sort it out. it’s getting embarrassing. *** nb. ether app v1.4 does not sing or dance. but v1.5 presumably will. **** this cannot be proven and yet remains a fact. ***** i am not addicted. it is just a game. it is just a game. it’s just a bloody game and i will destroy those pigs or die trying. ahem. sorry. a video i made to help promote the awesome ether books iphone app. download my stories by searching for daniel lewis under the author tab. i’ve raved about ether books already here, and i haven’t got much to add this time round, except to say that i’m now even more excited about the potential offered by ether, and more enthused about the talented writers the app promotes. as time goes on, ether’s stories will become available on other smart phones besides apple’s but, until then, it’s quite obvious to me that the only way you can enjoy the very best in short fiction is to BUY AN IPHONE NOW. 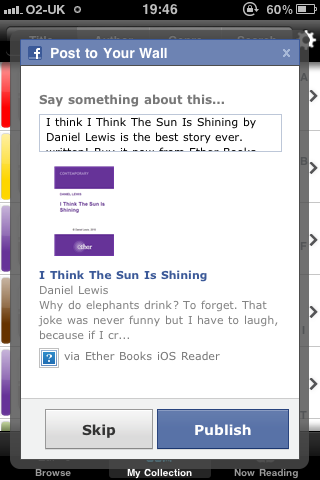 no, i’m not sponsored by steve jobs (yet), but i am pretty much in love with ether books. not least because i am currently ‘ether’s writer of the week’. 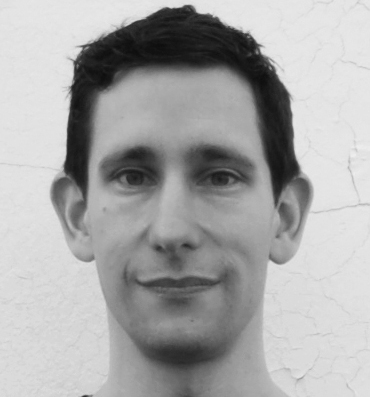 as a result – aside from guaranteeing me riches beyond my wildest dreams – ether interviewed me. you can read the interview here, you lucky thing. 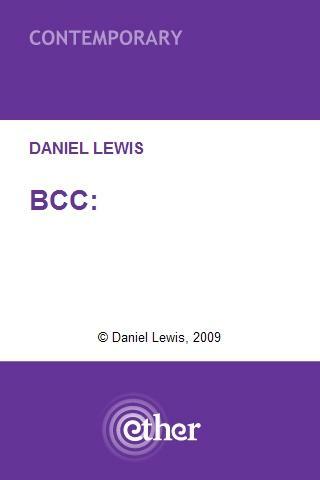 in addition, ether have just published another one of my stories, ‘bcc:’, which you can now download for 59p through the ether books app. ‘bcc:’ is a tale of infidelity and vengeance via email. it’s, like, well modern and about the internet and stuff (and therefore quite apt for the app, if you see what i mean). if you have an iphone and haven’t already downloaded the ether app, then you are obviously a cultureless wastrel and do not deserve an iphone. but it’s not too late to redeem yourself. free app available here. last time i shamelessly asked you to purchase an ether story (here), some of you actually listened to me and, over one month on, ‘i think the sun is shining’ is still their bestseller. i’ll be serious for once, and say that your support means a lot to me. thank you for giving me your 59p. mind you, ‘bcc:’s apparently rather good, so if you could chuck me another 59p, i’d be ever so grateful. 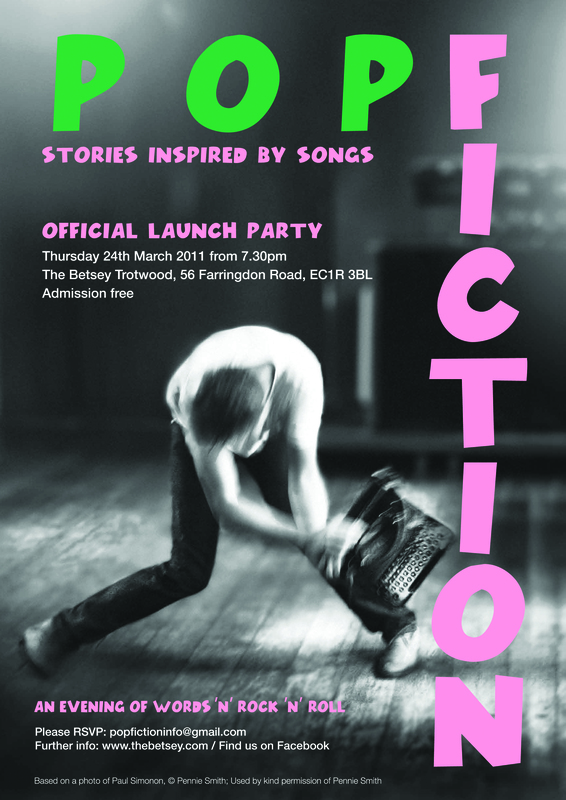 ‘pop fiction: stories inspired by songs’ launch party! if you are unfortunate enough to know me, you’ll have heard me banging on about pop fiction: stories inspired by songs a little too much over the last few months. even if you don’t know me, there’s a chance you know about the collection. after all, i did write about it in my very first post. well, the plugging isn’t over yet. not quite. the book’s out , we’ve notched up a few sales, and it’s had a few reviews, too. most recently, the literateur gave us a lovely write- up, plus we’ve had some decent feedback from the likes of sabotage blog, booksquawk and it’s all happening. and now, you lucky people, i’m pleased to announce that the launch party for pop fiction will take place on thursday 24th march, upstairs at the betsey trotwood, from 7.30pm. the plan is that around five of the pop fiction contributors will read a story each, plus there will of course be some great music to fill the gaps in between. come along if you can, it’s sure to be a great night, not least because the betsey is a great place for events such as this. i’m biased, though, as the pub’s located opposite the old guardian premises and was, therefore, essentially my local for quite a few years. the guardian’s moved, and i’ve moved on, yet i still can’t tear myself from this fine drinking establishment. it may have something to do with the draught asahi and endless variety of whiskies. oh, and yes i will be reading. probably my “ingeniously post-Modernist spin on song interpretation itself”, ‘disney’s dream debased’, influenced by the song by the fall. what a treat. an evening of words ‘n’ rock ‘n’ roll? gig of the year, more like. and you’re invited.